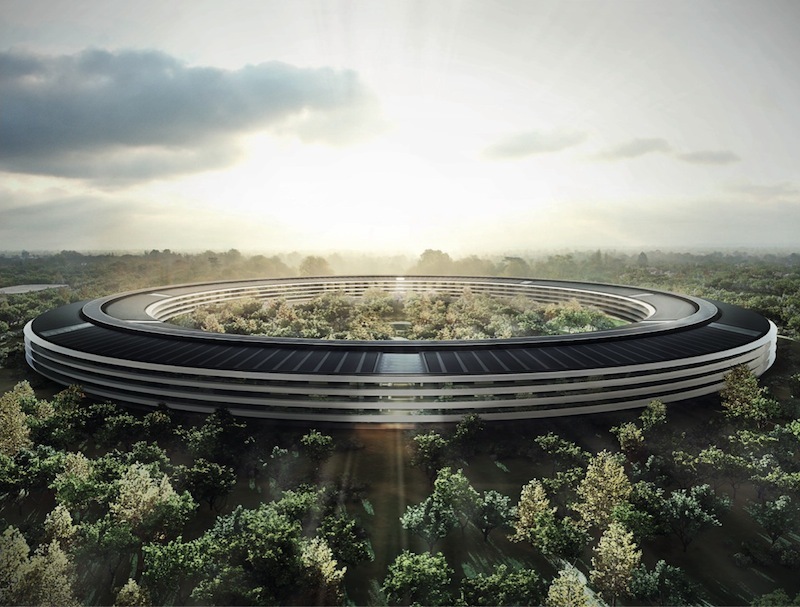 Apple's Campus 2 project, which includes the giant "spaceship"-esque building envisioned by Steve Jobs, has been thoroughly outlined in city plans and models that depict the company's vision for the space, but in an interview with Architectural Record, Norman Foster, who designed the campus, gives some additional insight and context on the planning process behind the project. Foster, who is the chairman of Foster + Partners, has led the construction of multiple high-profile buildings, including the massive Hearst Tower in New York and the bean-shaped McLaren Technology Centre that rests on an artificial lake. He helped Jobs design the campus based on Jobs' love of the Main Quad on the Stanford campus, and his desire to reintroduce native flora to the area. Foster did a series of case studies, inspired by a London square with a park in the center, which eventually evolved into a perimeter area surrounding a larger outdoor park. So a series of organic segments in the early studies started to form enclosures, all of which were in turn related to the scale of the Stanford campus. These studies finally morphed into a circular building that would enclose the private space in the middle—essentially a park that would replicate the original California landscape, and parts of it would also recapture the orchards of the past. The car would visually be banished, and tarmac would be replaced by greenery, and car parks by jogging and bicycle trails. According to Foster, though the building is large, spanning more than a mile around, it's also compact, much like an airport. To combat the sheer size of the building, its sections have been broken up with cafes, lobbies, and entrances, with each section of the building carefully constructed with social interactions in mind. The campus also houses miles of jogging and cycling trails, and Foster says that more than 1,000 bikes will be kept on the site for employees to travel around the campus. Landscaping connections and pathways will also help it to be more easily traversable, and parking will be underground to avoid marring the scenery. Currently, construction on Apple's Campus 2 project is well under way, and just a few months after receiving final approval for the campus, Apple has demolished all of the existing buildings on the site, allowing the building portion of the project to begin. When finished, the campus will house 12,000 Apple employees and will also include a fitness center, a presentation center, and more. Apple hopes to complete the project by 2016. Absolutely love the design of this building. Wonder if they will ever give tours of the facility. If they do I can foresee a significant boom in South Korean tourists visiting California. The idea is that the building will be so magnificent that no one will want to go home... ever. is it bad that i want to quit my job and be a janitor there just to work in that building? ...here at Globex, we don't believe in walls! As a matter of fact, I didn't even give you my coat! The 12 year old in me still wants to see a terrarium in the middle with Giraffes milling around. Apple provides free shuttle bus service and many employees use them.